The Coleraine War Memorial is located in the Whyte Street, the main street in Coleraine. It has been situated in an important prominent location in front of the Court House. The Memorial assumes a typical form comprising a white marble statue of a soldier on a tapered granite pedestal. The soldier's face is downcast and his gun is inverted. The east and west faces of the pedestal bear the names and ranks of those who fell in World War One from the Shire of Wannon, and the southern face has a memorial dedication written on it. The pedestal stands on two shallow granite steps and a granite plaque bearing the names and ranks in gold of those who served and fell in World War Two rests against it. The War Memorial was erected by subscription from the people of Coleraine and cost seven hundred pounds. It was built by Messrs. Corbin and Sons from Clifton Hill, and was unveiled in front of the Coleraine Court House on Empire Day, May 24th, 1921. The Coleraine War Memorial is of historic, social and aesthetic significance to the township of Coleraine and the Southern Grampians Shire. 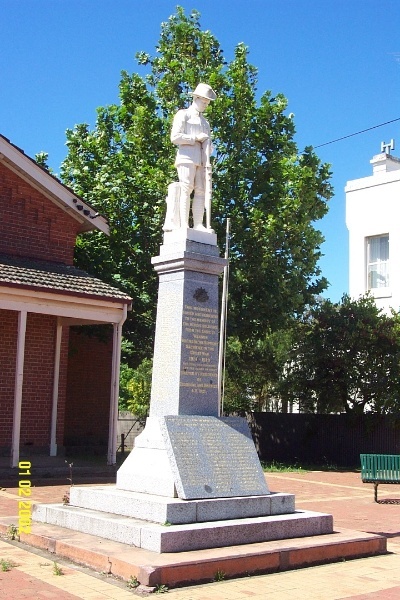 The Coleraine War Memorial is of historic significance because it commemorates at a local level some of the most important events in the national history of Australia and especially the roles of those from the community who served and died. It is of social significance as the focus of acts of commemoration such as Anzac Day and Remembrance Day, and as a place of homage for the community. It is of aesthetic significance for its use of traditional form, style and iconography to express deep meaning. This significance is enhanced by its setting and location. The memorial is in excellent condition. The Coleraine War Memorial is located in the centre of Coleraine, standing in front of the Court House in Whyte Street. The Memorial assumes a typical form comprising a white marble statue of a soldier on a tapered granite pedestal. The soldier's face is downcast and his gun is inverted. The east and west faces of the granite pedestal bear the names and ranks of those who served and fell in World War One from the Shire of Wannon. The Southern face reads "This monument is raised and dedicated to the memory of the heroic soldiers from the Shire of Wannon who made the supreme sacrifice in the Great War 1914-1919 for King and country and the cause of right. Erected by Residents of Coleraine and District A.D 1921". The pedestal stands on two shallow granite steps and a granite plaque bearing the names and ranks in gold of those who served and fell in World War Two rests against it. The granite tablet reads "Dedicated to those who made the supreme sacrifice in World War II 1939 - 1945". Formerly, there was a low fence of timber posts with turned tops and 'crinkle' wire around the base. Those who served in the First and Second World War and in subsequent wars.